What is the Chrysler Connection? – The Chrysler Connection is a online community devoted to Chrysler vehicle owners and enthusiasts. The connection was built to promote member sites of the Mopar Ring specializing in Chrysler brand vehicles and topics.. Surfing the connection is a great way to locate web sites containing information about Chrysler vehicles. How Do I Contact The Chrysler Connection? – To contact the Chrysler Connection concerning a feature, member or you are having a problem viewing our site, use our contact form Located Here. How Do I Get My Site Added To The Chrysler Connection? 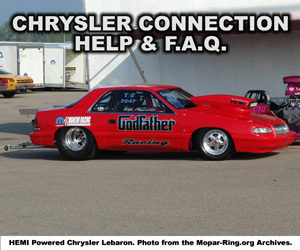 – The Chrysler Connection list is 100% comprised from member sites and pages of the Mopar Ring. Picked by the Ringleader, only member sites devoted to Chrysler brand topics are considered for the list. You can have your Chrysler site considered for the list by joining the Mopar Ring. My Chrysler site is listed, do I need to have a return link to the Chrysler Connection? – No, your Mopar Ring member return link is all you need. If you would like to add a return link we have added some text and graphic links below for you to use. Choose the Chrysler Connection graphic you would like to use below. Then right click on the Chrysler Connection image and select “Save image as…” Save it locally to your computer.